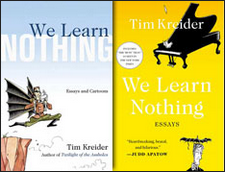 Tim Kreider turns his funny, brutally honest eye to the dark truths of the human condition, asking big questions about human-sized problems. These are the conversations you have only with best friends or total strangers, late at night over drinks, near closing time. As reality gets ever bleaker, Kreider’s humor becomes more apocalyptic, deranged, and hilarious. An hysterical chronicle of the end of the Era of Darkness (i.e. the War on Terror), and one man’s tentative restoration of faith in democracy. Why Do They Kill Me? Cynical, astute, blackly hilarious, and deeply biased, this collection is the artistic equivalent of hollow-point bullets fired from a high-powered rifle with a laser sight directly into the brain of the Bush administration. 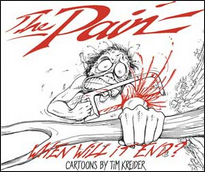 Kreider’s cartoons have attracted a cult following for their intelligence and unprecedented viciousness. Kreider presents the human condition with hilarious bleakness; you may be ashamed to laugh, but laugh you will.